Hurtigruten offers internet access on board all their ships, except the two oldest ships MS Lofoten and MS Nordstjernen (the latter is leaving the Hurtigruten fleet this year). At least two PCs in an internet cafe, and at least one wireless zone is available on each ship. Wireless access vary from ship to ship, and guarantied access is limited to the ships conference areas. The biggest suites on the ships also have internet access. There's also a generally good coverage for mobile phones. Hurtigruten is working to improve availability on their ships: According to Stockhouse.com, Hurtigruten "has deployed a new mobile network based on the Aruba Mobile Virtual Enterprise (MOVE) architecture in order to deliver Wi-Fi and guest access services to employees and passengers". This will be a great addition to Hurtigruten's already high standards and service to their passengers. It will also be highly appreciated by firms and businesses who travel with Hurtigruten, and who make use of the conference facilities aboard the Hurtigruten ships. 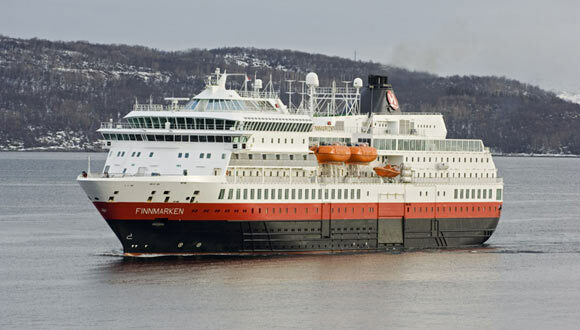 Hurtigruten is not the first cruise line to offer wireless, but high speed internet access will surely be welcomed by Hurtigruten's passengers. Great news! MS Finnmarken is now back on the Norwegian coast, for the time being replacing the MS Nordlys which is being repaired, and soon as a replacement for the ageing MS Nordstjernen. The Norwegian local newspaper Avisa Nordland has published more than sixty photos from MS Finnmarkens voyage on the Norwegian coast. The photos shows the ships interior and exterior, some of the towns and also pictures from some of the excursions that Hurtigruten can offer. And as you can see, the ship's pool is in use! How's that for exotic? The photos are called "From Bergen to Lofoten", take a look at them at Avisa Nordland. Related post: Nordic Prime Minister on board Hurtigruten 10.-11. June. Last fall Hurtigruten was struck by a tragic accident. A fire broke out in the engine room of the MS Nordlys and although all passengers were safe, two crew members lost their life. In the beginning of January this year, the huge cruise ship Costa Concordia of Costa Cruises struck a rock, started to take in water and eventually sank near the coast of Western Italy. Just this week, a new incident happened on a Costa ship. A fire destroyed the ships electrical power, and the ship is now beeing towed for several days to a safe harbour. Unfortunately, sometimes accidents happen. All passengers should take the time to read safety placards, and to pay attention during safety drills. In this way, passengers will know where to gather in an emergency, and how to put on the safety vest. Knowing what to do, will keep panic at bay. Here you can check out the safety videos of MS Nordlys, MS Midnatsol, MS Richard With, MS Polarlys, MS Vesterålen and MS Finnmarken. Below you can watch the safety video of Hurtigruten's MS Trollfjord. You're safe with Hurtigruten!